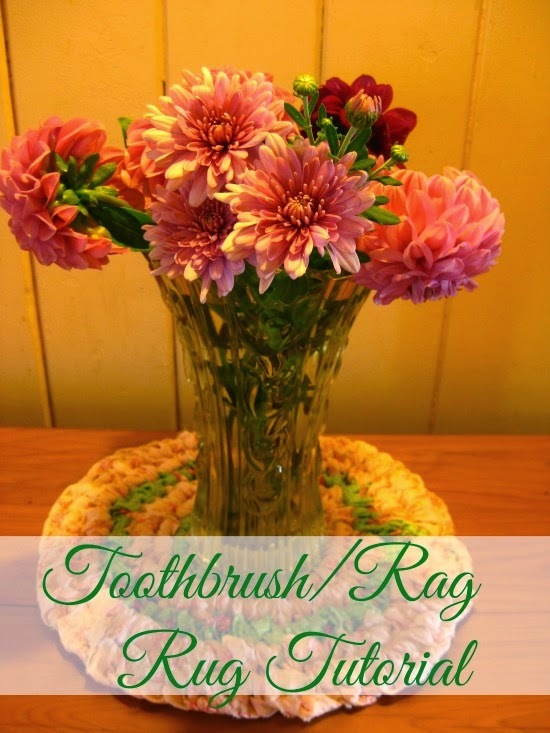 As promised here is my tutorial on how to make a Toothbrush or Rag Rug. Now I am no expert at making these rugs so do keep that in mind but I do have some good videos to include as we go along so take advantage of these which are made by more experienced rug makers. I have done lots of searches on YouTube for instructions to help you and came across Renata Rugs so will link to the videos as we go through the relevant steps. 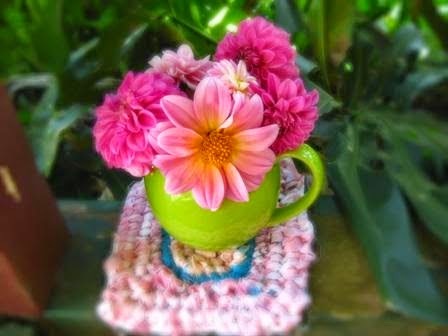 I don't have any need of a Rag Rug as such so have made some smaller versions which can be used to put hot casserole dishes on or a vase of flowers or whatever you like. The method is the same whether it is small or large. Firstly select the fabric you want to use. Some suggestions are old sheets, Doona covers or even old T shirts. Then either rip or cut strips approximately 2.5cm (1 inch) wide. You will need the strips about 100cm (1 yard) as, if you have your strips too long, they are difficult to work with. Before we start it would be a good idea to watch Aimee's Video on How to Connect Fabric Strips. This will give you an idea of how to join strips as you will need to do this many times. Once you have your strips ready take one strip and turning over the edge, cut on the fold so that you have a hole approximately1.25cm (1/2 inch). I made the hole a bit too big in the photo below but that is okay. You will need two strips of fabric to start off with. They can be the same colour if you like but it is less confusing to have the WS (working strip) and the Anchor (shown in green) different colours while you are learning. Call the strips what you like. There are quite a few variations of names on the YouTube videos. Now..take the WS (pink working strip) and thread it through the green Anchor. Bring the bottom end of the pink WS up and thread it through the hole of the top section you have just threaded through the green Anchor. Then pull gently to join the two strips. As I said the hole is a tad too big but it will be covered up.To make it easier to do the stitches you can use a safety pin or an elastic threader. I bought mine from Spotlight. Attach it to the bottom of your pink WS. Now we are going to start off. Firstly take a little time to watch the video How to Start Off a Toothbrush Rug Part 1. Take your WS and Anchor and pin them onto a towel to make it easier to make the first stitches.One of the ladies at our workshop had her Anchor pinned to her jeans as that worked for her. ...and gently pull. Normally I pull mine too tight so I have deliberately kept them loose for the tutorial. Continue doing this until you have as many stitches as you want. Aimee makes circular rugs in her videos and suggests putting six stitches on. 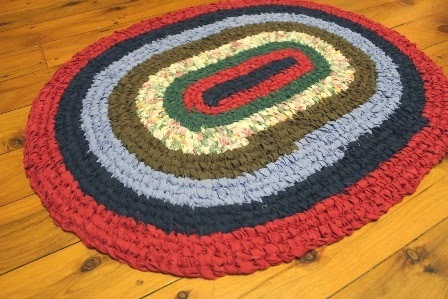 If you want to make an oval rug then just keep going. Have a look at the rugs the ladies were making at our Rag Rug Workshop to get an idea of how long to make that first row. ...and bring the pink WS around and now you are going to start stitching down the row into the stitches you have just made in the first row. This is a little tricky so perhaps watch the end of that last video How to Start a Toothbrush Rug and then watch the next one How to Start a Toothbrush Rug Part 2 which is a continuation of Part 1. Follow the instructions on the video and continue stitching to the end of the row. You will be doing the basic knot so have a look at the last of Aimee's videos The Basic Knot of a Toothbrush Rug. On the video you will see her tidying up her work as she goes along. As you can see in the photo mine is messy so if I was going to go any further with my rug I would fiddle with it and loosen it in places and tighten it in others before continuing. Also you will notice that the WS has been used up so another strip will have to be added using the method I mentioned before when starting off. Then you just keep going round and round. If your work starts turning into a bag shape then do two stitches into the same hole at the corners and if it starts buckling you can miss some stitches as you go along. It is all a bit of trial and error. When you decide your rug is the size you want then finish off the row that you are working on. Some people then pull the strips through to the wrong side, tie a knot and then weave the ends in to blend with the rest of the rug. There are instructions in the Rag Rug Cafe videos mentioned below. For more instructions you can find helpful videos at Rag Rug Cafe. I think that has covered most of the issues you are likely to face. I thought it might be helpful to have all the resources in one place. Some people don't like the look of the frayed edges and one lady ended up turning over and ironing all the edges on all her strips before ironing them in half when she was making the strips for her rug. The frayed edges bothered her a lot. LOL! So have a go at making one of these rugs or just make a smaller version like the circle in the first photo or my square which was meant to be an oval but I was talking too much at the workshop and obviously didn't follow our co-ordinator Margy's instructions. Then again, if YOU follow the instructions you might end up with a rug like Margy's. Doesn't it look fabulous? If you have made a Rag Rug before and have some advice to those starting out please leave a comment below as comments are often very helpful to others. If you can't leave a comment then could you send me a quick email via the 'Contact Me' form in the sidebar and I will put your comment on the blog. I have had to change my blog settings so that people can't comment anonymously as I get too much ridiculous spam. Thanks Chel for all that information. Rag rug making is such a useful skill to have. Margy's rug does look fabulous. They are fairly easy to make, Sherri. The trickiest part is starting off. Faye, I'd love to see what yours looks like if you make one. Mimi, I can imagine both you and Annabel making a rug in soft pink or baby blue! We have red dirt here so ours would end up with a slightly red tone although Margy's is still looking good after a couple of years of wear and tear. Just imagine after the apocalypse when everyone else is struggling for hand crafted rugs (because their will be no manufactured ones) you guys will be in huge demand and be the new "in vogue" decorators. Such a useful skill to have that could be applied to other materials perhaps. Im planning to be an expert in basket weaving when the time comes. Oh THAT Apocalypse! I thought you were talking about something in a movie. LOL! Thankyou so much for this. It would be great for under my feet in the kitchen. Can it be washed in the washer as well? It sure can, krystal. Margy had washed hers before the workshop as it has been in use for a couple of years. I look forward to seeing what you come up with, Annabel. I will let you know when I found the instructions for a heart shaped rug. Has anyone else come across any by the way? The tutorial is great. I like the idea of the smaller rag rugs too. I'm still doing mine as I want a floor rug. Although I'm questioning the sanity of this now as the material, if you remember, I used was all pale and white colours. Not so lovely for our red dirt. I'll keep at it till I finish it. How could I forget your rug, Shiralee. It was going perfectly while mine was growing into a square instead of an oval. LOL! Yours will look just lovely when it is finished. You don't anyone coming into the house from the garden with their shoes on I am sure. :-) Not like here. Hi Nanna Chel, I'm just checking out your traditional toothbrush rug tutorial. I've bookmarked this for when I make one with old sheets. Thanks.